Bill Bartelt began his professional career as an art director and designer for the stage, film and television. Over the years he nurtured his love of watercolor painting and studied with the late master Irving Shapiro, AWS. of the American Academy of Art. Bartelt at first applied his skills as a painter in service to his design work, developing watercolor renderings as scenic designs. Gradually he began showing his work as pure art, and along the way MGM tapped Bartelt to provide Minnie Driver's watercolor paintings for her film "Return to Me." Since then, his paintings have been seen in a number of other films, and have also found an audience among avid collectors. 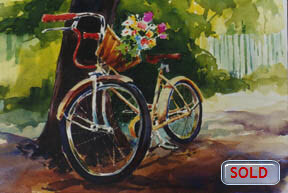 Bill Bartelt was awarded the Bucktown Arts Fest Best in Show Artist - Watercolors award. The Bucktown Arts fest has grown to become a neighborhood tradition and one of the city’s – and the country’s – premier arts festivals showcasing close to 200 participating artists and attracting more than 30,000 visitors annually. Original watercolor featured in MGM's "Return to Me"